"What's the Alternative" took place in Jam Asia Rock Station, Desa Sri Hartamas, Kuala Lumpur. We had TEN BANDS and the show kicked off about 7 with SOFT TOUCH. They played a half hour set and despite some errors (mostly committed by crack brained me) it seemed to go down well with the audience. There followed THE WALLET, distinguished by excellent songwriting and sweet-fervent vocals by Nazneen, who really is a musical gem. Then came XCITED SCREAMERS, signalling a change of direction for this five year old band away from the implications of their name with vocalist Fareeq doing more singing than scream-rapping - which he can do well - and in Malay too! 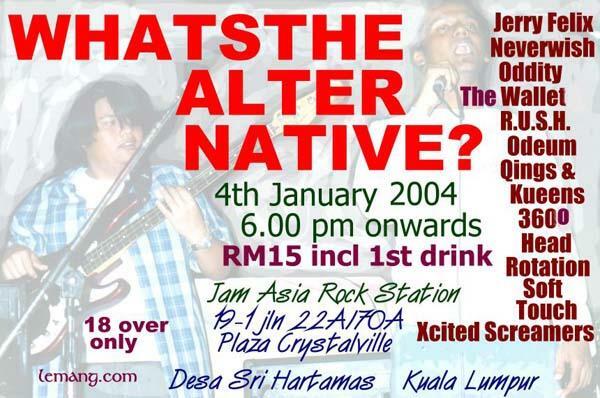 NEVERWISH, the next act had come all the way from distant Penang, with nice guitar-based alternative songs and well performed solos from right handed guitarist Sham and his left-handed singer/guitarist (name forget-lah sorry-lah). Three women and one man band ODDITY stormed the stage with throatist assassin Aadila's fit of emo-rage soaking the audience in an ordeal of grief and hopelessness and socio-protest at the benighted World (I loved it, as the tears came!). This amazing set was followed by JERRY FELIX, who, borrowing Paul and Vima from Qings & Kueens, and Sherman himself, gave us a brimming and dazzling display of what can be done with a drum set, decorated around U2 and an old seventies metal rock number "Born to be Wild", as well as with a couple of hands on cheeks close to the mic! Then there was R.U.S.H. who drenched us all in an instrumental emo downpour with multi-effects from a band fit to carry on the mantle of legendary Brit band Hawkwind. The strange name of 360 DEGREE HEAD ROTATION revealed a gutsy set by Malaysia's answer to Trent Reznor, Rafil Elyas, with a tight rhythm section and fine guitar riffs and solos from Jack. Finally, for those who were persuaded to stay, ODEUM gave us a fabulous experience which can best be described as Prog-Rock meets Grunge, with an extraordinary display of drumming capability from Shahril. Numbers were 65 paying dudes (does this word mean something bad? Someone in American sued another for calling him this - so sorry if you are insulted - not intended - just trying to be hip - yunderstand?) which was a bit lower than expectations, but it's an understatement to say that if you weren't there you MISSED SOMETHING! The sound was incredibly good, strong and punchy, deep and full - so we all have to thank SHERMAN TAN for both providing the venue and doing the sound. Thanks Sherman. I thought I was recording the whole show, but again something went wrong with the mini-disc walkman, though I haven't figured out what, because when I put the disc in again it said, to my horror "blank disc"!! How the valuable data was effaced beats me - if you have any ideas, e-mail me (maybe the battery ran out, I don't know). But cheer up because Sherman recorded some of the show on his Hard Disc, so there should be a CD out sometime for anyone interested. Once again thanks to everyone who came, and thanks to the bands who performed, and thanks to Sherman and Dino (who helped out with the sound), and to Mas and ...(sorry-lah the guy behind the bar) and the other lady who manned the desk, and to anyone else who feels they have been left out. 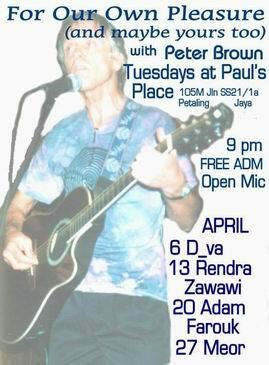 Tuesday Nights at Paul's Place organised by Lemang Music has come to an end at the end of April. and all those who came to the shows and supported the music. 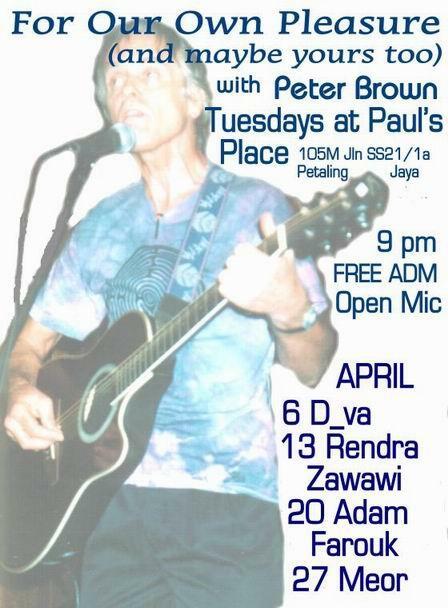 The series featured Peter Brown as host (and sometimes Markiza and Soft Touch ). We hope to do more events in the future . and we shall add your name to our regular mailing list. or was - it's a kind of hippy before their were hippies). but a truly scarey performance. As I said, everyone performed really well and it was a marvellous entertaining evening - I speak for us but I'm sure for all the other people present. Congrats to Ciplak who cross-dressed as Mother and daughter Christmas and executed their set without Azmyl who was called away by family ill-health - hope your mum's okay, Azmyl. In addition to a succession of original stuff we had covers from Joy Division, Alice in Chains, Stiff Little Fingers and yes of course The Stooges. Even Spongebag managed to summon up enough courage to perform, but it was rather late and his contribution was somewhat drowned out by audience participation. A fitting tribute to the man who championed Captain Beefheart, the Smiths, The Undertones and got the whole punk music thing going. We also in addition to the bands had (as mentioned above) the privilege of two fine poets, Ole Lillelund and another Malay poet with beautiful dreadlocks called Rahmat who read a fantastic poem at incredible speed. (I didn't really understand it but I'm sure it was amazing since he put so much expression into it). Hope you all (YOU WHO CAME of course) enjoyed the cake and the crisps. I enjoyed being the centre of attention for 15 minutes celebrating my birthday (no don't ask you should know by now). As a matter of fact 62 paying geezers and (what's a female geezer, folks?) turned up. braving the beguiling wind of other mouth-watering and alluring fixtures (how's that for mixed metaphor?). I'm sorry but we can't compete with the mega sponsorship guys who offer big stage music for free. So since we were splitting evens that made RM300 for us and RM300 for Paul (who only just breaks even on his fabulous nitespot and is dependent on this money to keep it going). Thanks to Ahmad for sitting and taking the money all evening, and to Rashid who was wonderfully useful running errands and assisting (as well as playing drums for Spunky Funggy). Roll in the sponsorship next time (provided you're not arms dealers of course). And a big big Thanks as well to Paul and David for being helpful and making the show run smoothly, and Paul for doing the sound and lights. Happy New Year, so long and thanks for all the cuttlefish Peter Brown.